The units of the Armee Abteilung Gaede spent the war in the Vogesen fighting in the valleys and on the heights. 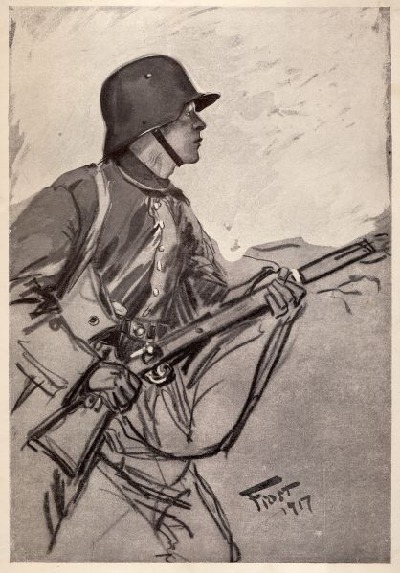 The fighting in the Alsace may have lacked the masses of men that made up the slaughters in Belgium, on the Somme or at Verdun, it was nevertheless brutal and bloody, both sides fighting bitterly but gaining little. 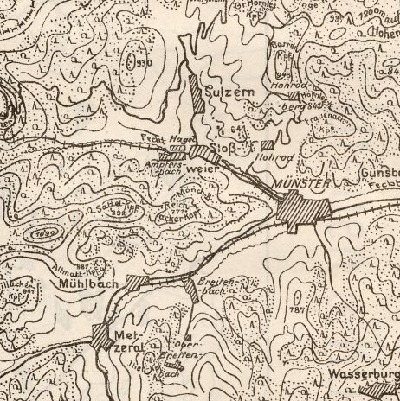 Hartmannsweilerkopf was arguably their most famous "small" battle, but on the the Reichsackerkopf and the Lingenkopf the French and German soldiers fought furiously and much blood was spilled. "A few days later. We are in the reserve positions again. The left flank of our sector had been engaged in some furious hand grenade exchanges. As I had written before, the trenches here were only 10m apart. The order came to storm these trenches. After warming our bellies with a drink we moved into the front lines from which we were to attack. At 05:00am on the dot the artillery began to fire on the enemy's rear and lines of communication. Because the trenches were so close they could not fire on the enemy front line. The French artillery and trench mortars replied immediately and we began to prepare the way with hand grenades. Unfortunately at 07:00am the accuracy of our artillery began to suffer as our own 210mm shells landed behind us, slowly getting nearer. Damn, it was getting dangerous. A French trench mortar scored a direct hit on our assault column, and the fire got heavier and heavier. It seemed as if the world was coming to an end... the screams of the wounded was terrible. 08:00am ...at last, time to advance. I looked around and saw my lieutenant and four men, the pathetic remains of the assault troop. Still, we were going to advance. We began to pull the sandbags out of the way, little infantry fire came our way. We were convinced it would be light work ahead, two pioneers clambered out of the trench. Suddenly machine-gun and rifle fire opened up knocking the two pioneers over. Hand grenades rained down on us, the sky darkened as the trench filled with smoke and fire. An artillery officer came down the trench, wounded and insane, he shouted "follow me!" and jumped out of the trench, he took one pace then collapsed. We started to throw grenades towards the enemy trenches until it seemed as if our arms would drop off, but we could not hit the machine gun. Suddenly I felt a burning on my right arm, it was a flesh wound, next to me a comrade was hit in the mouth. Any further attempt to leave the trench would have been suicide. Towards midnight it became quieter. The next morning we were relieved by another company an went back to the reserve line where we fell into a deep sleep, like dead men. A few days later after getting our replacement troops we went forward again, this time further to the right near Mönchsberg, here it was quieter. Eight days later we were relieved by the Bavarians again and we had twenty days of rest in Colmar and Schlettstadt." 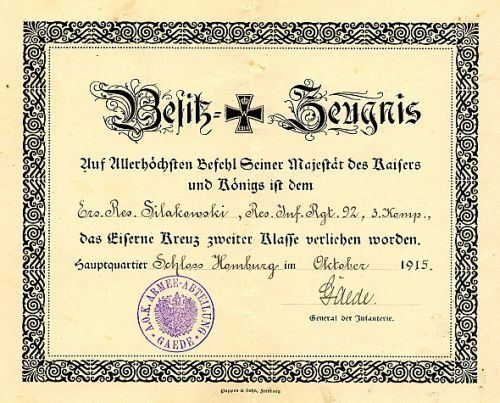 The Iron Cross 2nd class document for Ersatz Reservist Silakowsky, 3rd company, 92. R.I.R., he fought on the Reichsackerkopf and Lingenkopf.